From the funds raised, donations will be made to a variety of charities and beneficiaries. All donations have to be approved by all board members. A list of the donations can be seen on this page and a detailed breakdown can be seen by clicking here. Help for Heroes. H4H supports and rehabilitates seriously injured service personnel as they return to an active life. Click here to see their Certificate of Appreciation. Jubilee Sailing Trust. Our mission… to promote the integration of people of all physical abilities through the challenge and adventure of sailing tall ships on the open sea. Find out more about us on our web site. Francis House Children’s Hospice supports over 300 children and young adults and their families, by providing a place of refuge and hope. We rely on voluntary donations for over 80% of our annual £3.8 million running costs and so we are extremely grateful for the support of The Captain James Philippson Trust Fund. ABF The Soldiers' Charity. The national charity of the British Army since 1944. Click here to see how ABH have used their fund to help individuals. Iain Rennie Grove House Hospice at Home A Hospice at Home service for those with life limiting illness. 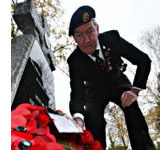 SSAFA Forces Help Offering financial, practical and emotional help to young, old, serving or retired service personnel. FANY (First Aid Nursing Yeomanry). The Princess Royal's Volunteer Corps, teaching skills such as first aid, radio comms. and on call 24 hours a day tot he City of London Police in times of emergency. Devon Air Ambulance. Saving lives of surfers, walkers, medical emergency, swimmers and sailors. Algoz School. Providing education and care for children suffering from Autism, Algarve, Portugal. The Forces Children's Trust. Devoted to helping dependant children who have lost a parent whilst serving with the Amred Services. St Mary's Church. Recently erected a new memorial dedicated to those whose lives have been changed or lost in recent conflicts. Queen Alexandra Hospital Home A hospital supporting injured military and ex-military patients. Centro Hospitalalar de Lisboa Central EPE. . The dedicated childrens' ward was provided with a music system for the recovery area for patients following surgery and treatments. The Foundation for the Study of Infant Deaths. The Foundation for the study of infant deaths. www.fsid.org. In memory of baby Toby Moody who died in June 2009. The J's Hospice. Helping to provide specialist care for young people in their own homes. St Albans and District Bereavement Network. Providing a network of bereavement support for those in the St Albans area. MacMillan Cancer Support. Providing support for those this cancer. The Back-Up Trust Helping those with spinal injuries reach and surpass their aspirations. The Meningitis Trust. In memory of baby Jake Brown, who died in 2005. Helping to research and find a cure. Cancer Research UK. Funding research into the causes and cures of cancers. The Rowans Hospice. Providing specialist equipment, mental and physical help to members of the Naval Stations, Dockyards and Commandos in Portsmouth. Llanberis Mountain Rescue Team. Looking out for climbers and walkers in North Wales. Gurkha Welfare Trust Providing financial, medical and community aid to alleviate hardship and distress among Gurkha ex-servicemen. The Shooting Star Children's Hospice. Providing hospice care for children and teenagers with life limiting illnesses. Armed Forces Memorial Appeal. Providing the National Memorial in the centre of the UK. Jane's Appeal. Set up in memory of Jane Tomlinson, CBE, providing support for children and cancer patients. Teenage Cancer Trust.Providing care and support for teenagers suffering with life limiting illness. Royal Marsden Cancer Campaign. In memory of Mark Benatar.